Back in February when we were on our eleventy-billionth (numbers are approximate) snowfall of the season, I clung to bright and colourful knits. Casting on for something Fair Isle was just good prescriptive knitting at the time, never mind fun. But the Venezia pullover ended up taking top priority and so Glowing got pushed to the side, not to be finished until the end of April. I’ll have to wait until next fall and winter to take full advantage of this FO. Yarn: Mission Falls 1824 Wool, MC ‘Raspberry’, and several other CC colours. All yarn is to specification from the book, with the exception of the pale green shade – I substituted in the slightly cooler ‘Thyme’ shade instead of the ‘Pistachio’ which is a little more in the bright yellow area of green. I like the overall effect. Needles: 5.5mm for the fair isle sections, 4.5mm for the plain stockinette. Mods: I had to up-size the needles on the fair isle to get closer to gauge, and actually I think in the end I still came out sliiiiiiightly more snug on gauge than the pattern. The final product does fit, though, and I’m happy with that. The major modification that I made was to add an extra row between the raglan decreases for several of the decreases, to add a bit more room in the shoulders. My row gauge was a bit too snug on the stockinette and I needed to make sure my arms and shoulders would still fit. This worked out well. I’m pretty much in love with Mission Falls 1824 wool, after this project. There will be more sweaters with this in the future. It feels glorious to knit with, and the colours are so rich. I put it through the washer and dryer (YAY superwash), and you’d never know. Not a pill in sight. It is, however, a yarn that rewards swatching – stockinette does grow a little bit after it is washed and dried. I admit I was pretty much banking on this happening because my pre-wash gauge was more tight than it needed to be. (But the stranded sections did need to be closer to pattern gauge to start – colourwork does not stretch as much as plain stockinette). I must thank Steph for taking the photographs, and letting me finally put this FO up for the record. Since a hooded wool pullover isn’t quite what I need for summer, though, this will be taking up residence as a shop sample at the Purple Purl, until I can reclaim it again for the winter. that is super cute and colorful!!!! It is great and will be so bright and cheerful next winter! I love it! It’s funny, but I was cruising through your projects last night (I don’t mean to ravelry stalk, I was just looking for some inspiration!) and saw Glowing, and was wondering when you had finished it! It looks great, I really love that raspberry colour. Yeah, definitely going to have to do that one too. You, madam, are a temptress. A very skilled temptress, with great sweaters. 1. Are you available for other graduate work, i.e., mine? 2. How do you get your hair to look so awesome? Come summer, my curls, they are not so good. Wow, it looks fantastic. It will keep you toasty warm next winter. Glow is a beautiful knit and does indeed suit you. What a great-looking sweater! Wow! It’s positively glowing. 😉 Mission Falls 1824 Wool really is a great yarn, isn’t it? I just love how it feels while knitting. So soft and nice. MF is definitely in my future plans. If only I could stop buying the Indigo Moon and save my scheckles! I don’t remember your starting that. I love it. Knowing you’ve got Glowing waiting for you won’t make the coming of winter nearly as painful — though I’d just as soon it take its time. It looks great Glenna. I have hardly seen any knits from that book so its nice you finished it! Hawt. Me likey. And quality photo-snapping too. You should knit the photographer one. It’s gorgeous & I love the colors. You look so lovely in it! Congrats on such a great job you look amazing in it. Love it! Can’t wait to see it at PP. I know what you are saying about Mission Falls! I’m just working with for the first time and it won’t be my last! 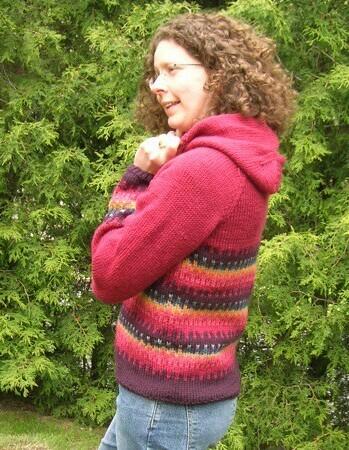 As for your sweater – it really is Glowing – those colours must have been great to knit with during our oh so white winter! I am also impressed once again at the flawless fit your sweaters always seem to have! Lovely. Any bigger and it would have been too big. Your patience with fair isle boggles my mind. 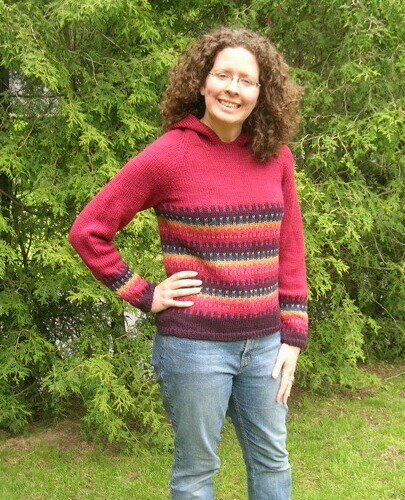 Wow woman, you are a colorwork machine!! NICE job. It looks lovely on you…but don’t wish the fall on us just yet!